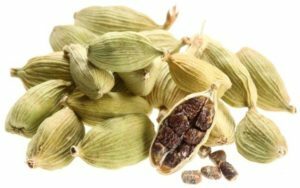 Cardamom has a cool, minty aroma and flavor. It is one of the most expensive cooking spices. This essential oil is a flavorful spice for cooking and baking, predominantly sweets, baked goods, and beverages. It adds a great Indian flavor. Add Cardamom to breads, smoothies, meats, and salads to enhance flavors. Diffuse Cardamom for feelings of increased mental clarity. Breathe it in for sense of openness and clear headedness. Cardamom blends well with Lavender and Clove. Apply it to your chest while planting flowers or cutting grass. Cardamom delivers a cooling sensation to the skin. Blend it with Ginger, Spearmint, and Peppermint for a soothing aromatic experience. Diffuse it for a clearing, refreshing aroma that promotes a positive mood. This essential oil promotes feelings of calmness and relaxation.